Quirky Jessi: Kidorable umbrellas -- Oh so precious! Kidorable umbrellas -- Oh so precious! 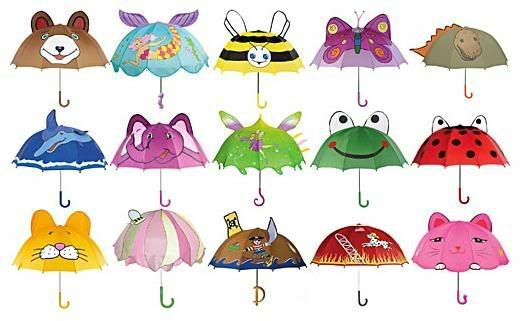 Kidorables....what better word to use for adorable children's umbrellas? The Umbrella Shop has tons of really awesome umbrellas, but it's these quirky child-size ones that caught my attention. Located in Vancouver, CA, there's a $15 charge for shipping for those in the US, but their umbrellas are reasonably priced in the first place, so well worth it....especially if you order more than one and get their 10-30% off discounts. What I want though is one of those see through umbrellas so you can see people coming towards you and not poke them in the eye only I want one that folds up really small and they don't exist. Yet. I know what you mean. I prefer my umbrellas to fold up really small so I can tuck them in my bag or glove compartment, but I haven't seen the clear ones in tiny size yet either. Hopefully soon!